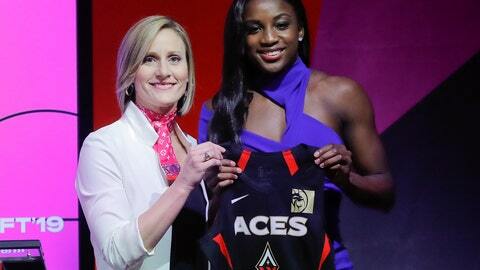 NEW YORK (AP) — Jackie Young said it was a dream come true to be taken first in the WNBA draft. “Since I was a little girl I always wanted to play in the WNBA and now I have my chance,” she said. She’s the second Irish player to be drafted first after entering early joining Jewell Loyd, who had the honor in 2015. It’s the third consecutive year the Aces have had the No. 1 pick. They took Kelsey Plum in 2017 when the franchise was still in San Antonio. The Aces then drafted A’ja Wilson last season with the No. 1 pick when the franchise moved to Las Vegas. Young wasn’t thrilled that she didn’t have much time to make her decision after the Irish lost the championship game Sunday night to Baylor. She had 24 hours to decide whether she wanted to turn pro or go back to play for the Irish. The Los Angeles Sparks took Baylor center Kalani Brown seventh. It’s been a whirlwind 72 hours for the 6-foot-7 center as she helped Baylor win a national championship on Sunday. Chinese sensation Han Xu was drafted 14th by the New York Liberty. The 6-foot-9 center became the first Chinese player drafted since 1997. There was some talk that Han wouldn’t be able to play this summer as she would have to compete for the Chinese national team. She said that she expected to play for New York this summer.